The Koolatron P-20WH 12 Volt Cooler is perfect for those with limited space who need to pack along food and drinks for the trip. 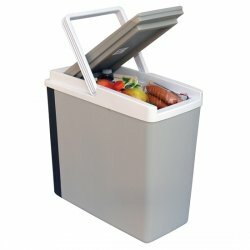 This cooler fits nicely between front seats in many passenger vans as well as behind the front seats in most cars and trucks. It is slim, tall and not too wide. The door is sealed with a rubber gasket to improve cooling efficiency and help keep contents cool longer once unplugged. This thermoelectric cooler draws very little power for an electric car cooler and is fairly lightweight. This 12 Volt Cooler is powered directly from the lighter socket or 12 volt accessory outlet in your car, truck, SUV or boat. It is "turned on" by plugging in the power cord, and "turned off" by unplugging the power cord. Clean up is easy with a damp cloth (not dripping) and a mild detergent. A thermo electric cooler is a must have on-board a personal aircraft! It is so nice not having to rely on ice and taking a real refrigerator up there worries me because of the compressed gas for cooling. My passengers and I are very happy with this. Hugo Y. Works very well for drinks and snacks for the grandkids. Fits perfectly between the front seats in my Astro and doesn't seem to bother the battery at all when the van's not running for short periods. Thank you, Gary G.